Home Have a Cuppa Thank you everyone – my book is on the Amazon best seller list! The rankings change and update hourly so they will move and drop but for the moment I am a very excited Sharon! Thank you to everyone who has purchased the book, spread the word and left a review! I am feeling like it was not so much hard work after all! Just ordered mine! Gotta have it before it disappears off the shelf. Hi Sharon, Congrats on reaching the best sellers list, Received the book on Monday. Already read it from cover to cover. Once the templates arrive… (I know, I gotta wait, SIGH!!! )… I thought I had actually completed at least one of the blocks of this old quilt I told you about… After looking through the book I can see I have lots more happy and creative stitching to go. This is going to be one fantastic quilt once completed… thanks to you, your book and the templates. Thank you, sharon! A wonderful, informative book!! I have a great idea for the next book, print your wonderful stitch dictionary and make it spiral bound!!!! I’d love a hard copy instead of printing them out all the time and could take it with me to guild and stitch in meetings. Tell them you’ve had requests for it so it can be taken to meetings and guild events. I bet I’m not the only one who would love it and you have unique variations to other ones available. Happy to help get it done! Congratulations, Sharon. You deserve this. Your book is my bible for stitches and creativity in crazy quilting. Gorgeous book. Between this book and your TAST list of stitches, how can we, stitchers, go wrong. Happy as a lark. Keep us lefties in mind though when posting stitches. Thanks. Congratulations! That is so exciting! You deserve it! What a fabulous treat for embroiders and Crazy Quilters! Beautifully photographed with such scrumptious eye candy. Congratulations Sharon! Congratulations! I’m anxiously awaiting my copy but no sign of it being shipped as yet. This is wonderful, well deserved. I have my book, it is great! Congrats, Of course it is! Received mine last Thursday and love it! Thank you Sharon for a wonderful book. You are an amazing lady. I also want to thank another amazing lady, Mary Corbet, for introducing me to you through her blog. I read about you and your 2020 challenge and decided that I wanted to join and of course I needed your book. I am very excited for you – you deserve much praise. I now follow two wonderful amazing needle ladies!! Good for you! I’m waiting not so patiently for my copy of your book to arrive. I ordered it last week. I enjoy your stitches and your blog. Thank you for sharing your knowledge and talents. You deserve to reach the top of the book list Sharon. So much of your time, effort and knowledge has gone into the book. I hope the book remains on the top for a long time yet. I’m keen for the book to arrive, it looked so good online. Congratulation. I ordered my copy some time ago and it arrived today. Can’t wait to get into it. It’s arrived, it’s arrived, Sharon’s book has arrived! Don’t interrupt me and go feed yourselves I’M BUSY. Sharon, congratulations it’s amazing, your talent is off the planet! Is it worth the wait? Very much so. Fantastic! 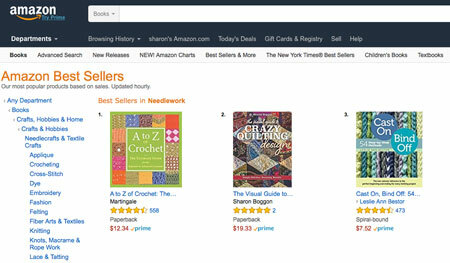 🙂 It was #1 New Release in Needlework when I ordered my copy yesterday. 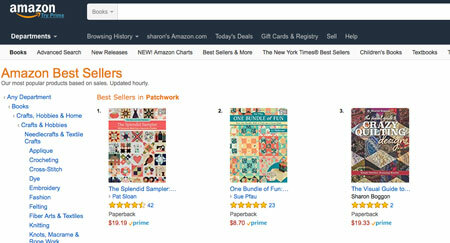 At this moment, it says #1 Best Seller in Embroidery. How exciting! I ordered my copy yesterday. Thank you for all your posts and tast. That’s wonderful! Congratulations! I just put my order in. I can’t wait to get it. The accolades are well deserved Sharon. You have given so generously to your (our) craft. I can’t wait for my copy to arrive. Congratulations Sharon. I bet you are dancing around the house and i hope Gerry is too. Honoured to be your friend. Thats great news, well deserved! My copy is on its way and I’m sure it will be the go to book, just as this is the go to website for all things to do with stitching and embroidering. Thank you for sharing, and for all the hard work that goes in to helping and inspiring us all! A wonderful, informative book!! Thank you Sharon. Naturally – not surprised at all. Congratulations, Sharon. Received my book from Amazon on Friday and love it! Lots of inspiration for the 2020 quilt. Its a beauty!! I love it! Just so happy with your book. I love everything you do. Beautiful, inspiring book. Thank you so much! Woweee congratulations Sharon, that’s wonderful news the hard work is paying off and you certainly have reason to be excited. Im sure you deserve it!!!! CONGRATULATIONS!!!!! I just got it and love it!!!! Can’t wait to really explore it more and ready for the second book! Congratulations. Just received my copy. Looking forward to a good read then putting it into practice. I’ve never tried crazy quilting. I have made. Regular pieced. Lap quilts so it’s a new challenge and embroidery. Only cross stitch but I’m sure what with your tutorials. Will do well. Congratulations! Your giving spirit is so inviting and your excellence in expertise shines brightly! I am very happy for you. Thank you for sharing your joy in stitching.